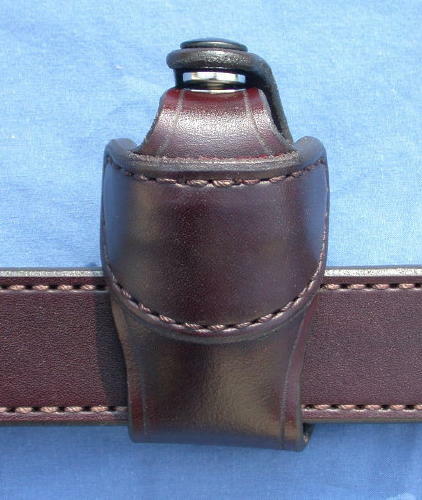 Belts - Belts are double thick and stitched along the edges. 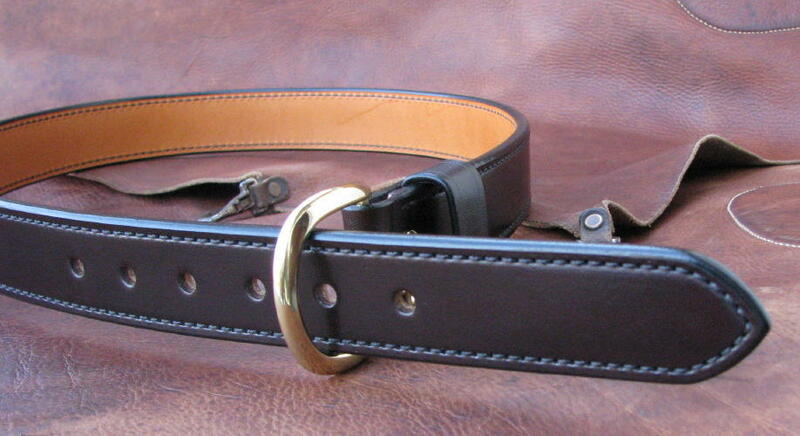 Buckles are solid brass. Prices start at $135.00. 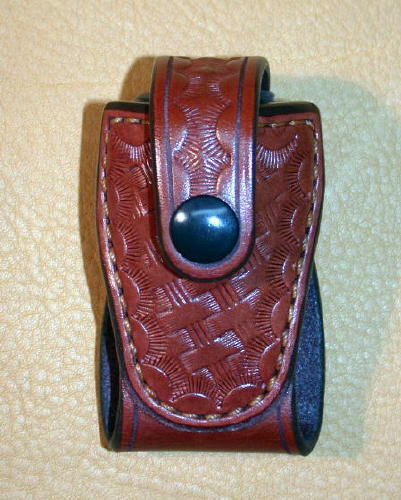 Basketweave and exotics available. 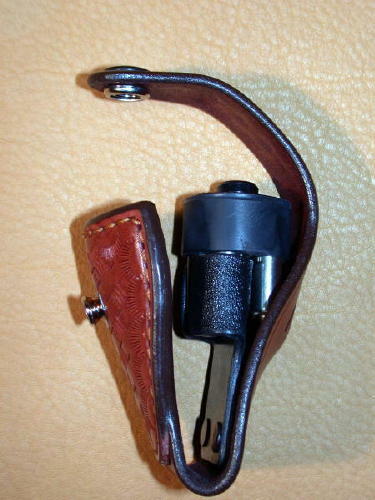 FMC - (Patented) Full Moon Clip carrier. Made for .45 ACP, 7 and 8 shot .357 mag, and 10MM. Prices start at $85.00. PMC - Price: $26.99. 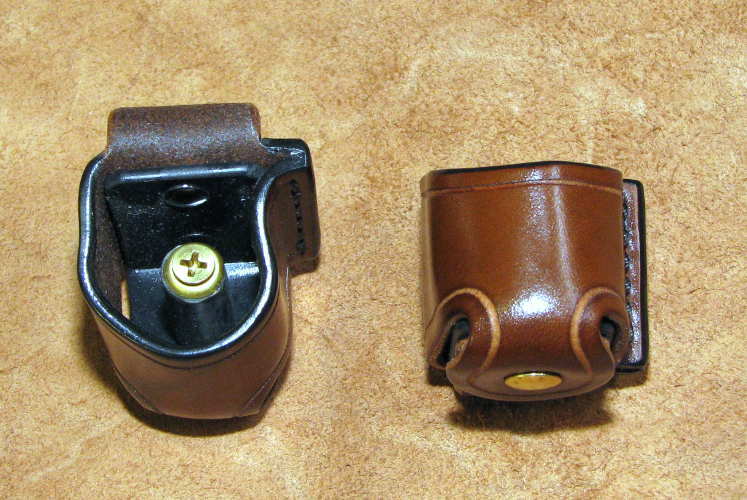 This patented moon clip carrier is designed to be used with S&W J-frame and Ruger SP101 & LCR .38/.357/9mm five shot moon clips. It retains the loaded moon clip by bearing on the cartridges with a user adjustable center post and holds the rounds between the outer cup and the center post to keep the moon clip being from twisted or bent. 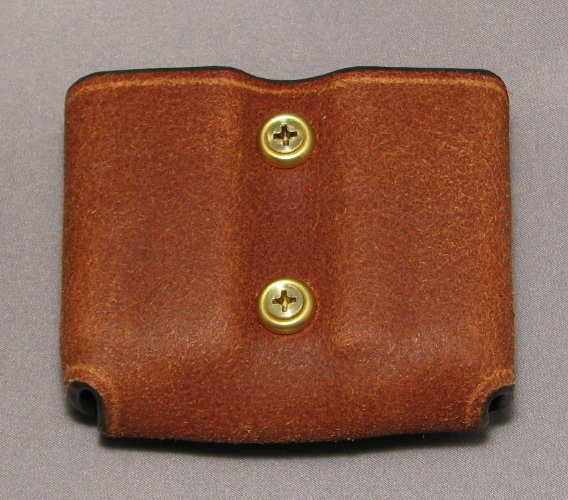 Although it was designed for concealed pocket carry for a reload, it provides a safe way to carry your loaded moon clips to the range as well. Specify .38/.357 or 9mm. A push-off has been added to the PMC to aid in separation of the loaded moon clip from the carrier. An original length screw is also included for those who prefer that version. SLC - Single speed loader carrier for HKS loaders. Steel reinforced. Cartridges straddle the belt. Prices start at $80.00. 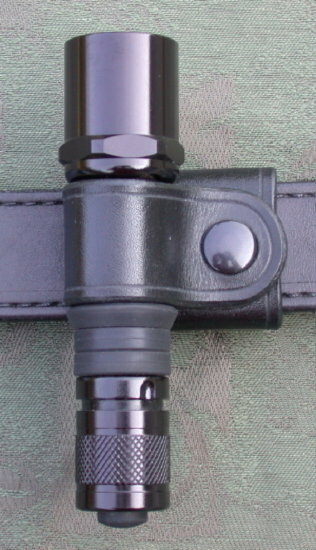 Z2 Flashlight Carrier - Designed in 2003 for members of a federal SWAT unit. 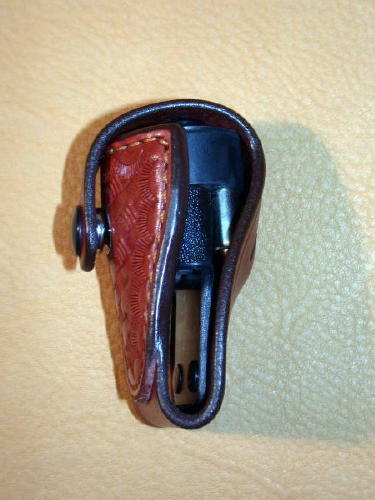 It allows secure belt carry of a Z2/3 type flashlight either bezel up or down. One way snap accessable. Prices start at $75.00. 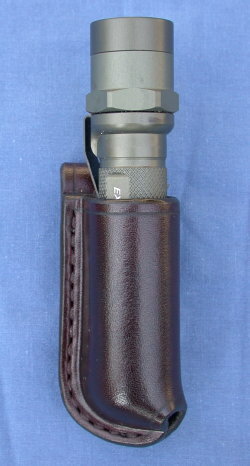 SF Flashlight Carrier - Made to carry the various flashlights with a tail cap the same diameter as the barrel. Prices start at $80.00. SM - A magazine carrier with a tunnel loop attachment. Prices start at $75.00. 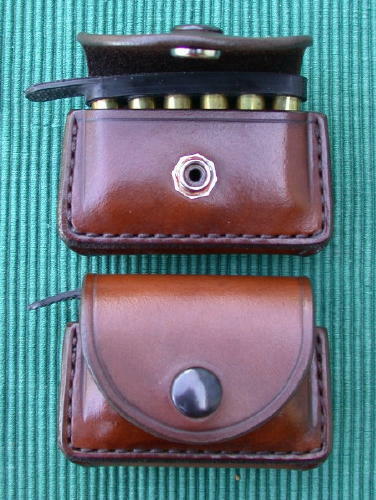 Five Shot Moon Carrier (Patented) - A belt mounted moon clip carrier for the J-frame .38/.357 . 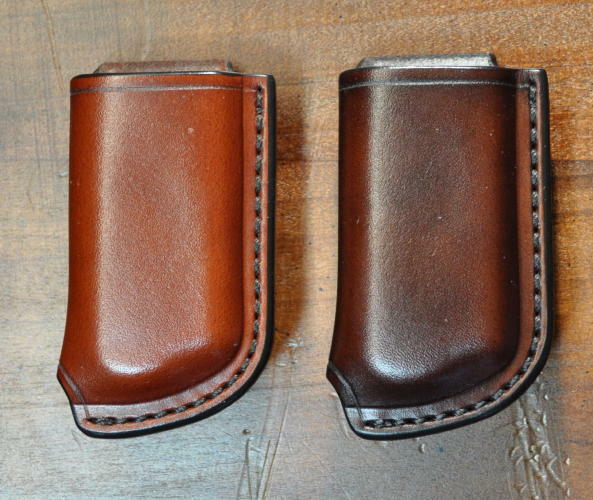 Only available with 1.5 inch belt loop. Prices start at $80.00. 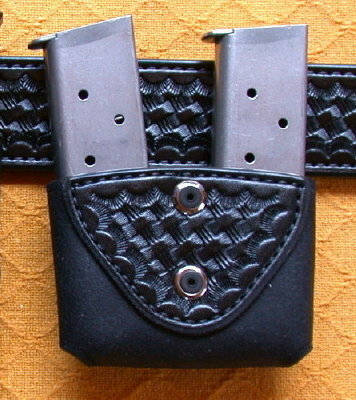 DM - A double magazine carrier with dual tension screws and belt slots. Prices start at $115.00. 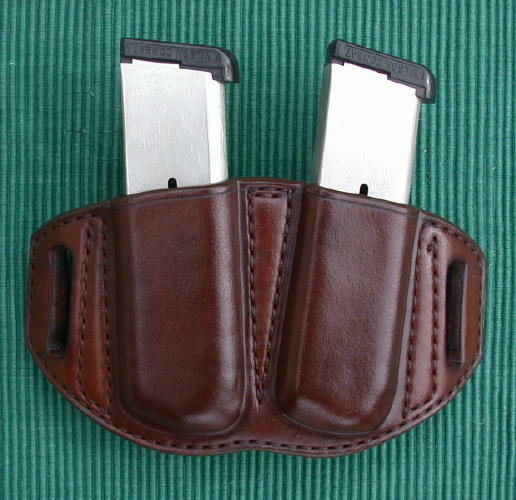 DM-LP - A double magazine carrier with belt slots. Prices start at $115.00.